full-featured 35mm photography in a compact package. © 2002 - All Rights Reserved: See bottom of the page regarding fair use. Film Rewind: Film release button on the bottom of the camera. A Fully Spec'd 35mm Rangefinder Camera in a Classic Format. The Olympus 35 RD offers an impressive combination of fine optics, straight forward ergonomics, packaged in a classic format. Manufactured from 1975 - 1979, the 35-RD is the last fixed-lens 35mm rangefinder camera to be introduced by the Olympus Optical Co. Ltd. of Tokyo which features a full manual override mode. Its fast, f/1.7, single-focal length lens, coupled to a fully mechanical between the lens leaf-shutter from Seiko, makes this a compact 35mm camera with serious capabilities, when its working properly. Introduced just before the era of plastic bodied, electronically controlled, auto focus cameras, the 35RD is fully functional as a battery free manually operated camera that compliments a battery dependent automatic exposure mode and a fully mechanical, automatic mode for flash photography. The 35-RD was one the industry's last solidly constructed, metal bodied, fixed-lens 35mm cameras with a semi-professional grade of fit and finish. Unfortunately, in revising this 16 year old web page, I must state, sooner not later, that the Olympus 35RD comes with two big buyer beware alerts. In today's market, the Oly 35RD is usually over-priced when compared to some compact 35mm SLR cameras from the early 1980'ies era. Back in the late 1990'ies, early 2000 era, a working Olympus 35RD could be purchased for around $50.00 to $75.00 USD. That was when a used SLR with a 50mm lens was at least double that amount. Today the pricing situation is reversed. The biggest caveat emptor to arise since posting the original web page involves reliability. Nearly every Olympus 35RD will eventually develop a shutter problem. The previously mentioned Seiko shutter on this camera has not aged well. After a certain number of years, the original lubrication for the lens focusing helicoid, breaks down, then migrates onto the shutter and aperture blades. The shutter will then stick open at slow speeds, ruining your photos. Symptoms also include an inconsistent opening of the aperture, even if the shutter seems to be working. The only cure is to have the shutter properly serviced by a competent Olympus service technician. Is it worth having this repair done properly? My experience is unless your technician literally rebuilds the shutter, it'll be a temporary repair at best. Like more than one of the many fixed-lens rangefinder cameras from this era, if the battery quits, only the AE mode is disabled. The battery is only used when the aperture ring is set to the auto exposure setting. To conserve the battery while in the AE mode, simply place the lens cap back on the lens when the camera is not in use or set the aperture ring to a different position. As far as I know, the 1.35 volt mercury oxide battery cell that is used in the 35-RD is no longer being made. That's a shame, because mercury oxide cells have a very even and reliable discharge voltage that's perfect for these old CdS light cells. So, it may pay do a search for either the PX625 or PX13 button cells while there are few left. I use a Kanto MR-9 battery adapter from Japan, which converts the 1.55 volts of modern silver oxides to 1.35 volts. The other alternative is to try using a Z625PX or MRB625 zinc-air replacement cell in place of the old mercury oxide cells. The downside to zinc-air cells is they have a short lifespan. In a dry desert climate that limited lifespan may only be two months. In the humid climate where I live, they last about six months. A one dollar #675 Zinc-air cell for a hearing aid works well provided a rubber o-ring is installed around it to take up the slack. The more permanent solution is to have light meter calibrated to accept silver oxide battery cell. This usually can be done while having the camera cleaned, lubed and adjusted, CLA'd, at a reputable repair facility. Silver oxide cells are available by special order, and provide a constant voltage over their life. However their voltage is about 1.55 volts, so you can't just drop one in and expect to have accurate exposures. Beware of alkaline batteries. In case you are considering the use of alkaline cells, be aware that their oultput voltage will decline significantly during use, resulting in a wide range of inaccurate meter readings. The metered automatic exposure mode is selected when the aperture ring is set to A. The flashmatic mode is selected when the aperture ring is set on the lightning bolt. It would have been helpful if Olympus followed the Canonet's example and put a lever or finger friendly grip post on what can be described as a very thin aperture adjustment ring - which is extremely difficult to grip with the only a couple of fingers. In the AE mode, (labelled A), you just just select a shutter speeds and leave the aperture setting to the camera. The AE mode is the only mode in which the light meter functions. Therefore, it is the only exposure mode that requires the camera to have a battery. Both the flashmatic and manual modes are unmetered. The lightning bolt to the right of the A, as mentioned, is the "flashmatic" setting. In the flashmaitc mode the 35-RD will ingeniously set the aperture to match the focusing distance for a proper night time flash exposure of your subject. Focusing is done via a double-image rangefinder which is coupled to the focus ring. It's black serrated focus ring on the 35RD has a nice dampened feel to it, (so long as if the helicoid grease hasn't leaked onto the shutter assembly). The focus ring is coupled to the rangefinder apparatus in the viewfinder. Simply adjust the focus ring until the image of the rangefinder patch directly overlays the main image in the viewfinder, (see number 5 in the image below). The front ring on the lens barrel is the shutter speed ring. The selectable shutter speeds range from a 1/2 to 1/500 of a second and a B setting. Shutter speed selection has a nice precise feel, but be forewarned that you'll have to take your eye off the viewfinder to see what shutter speed you selected. A graphic representation of the 35 RD viewfinder is shown below. The viewfinder is quite basic. In addition to the rangefinder focusing patch, it includes an aperture display needle, which can be used with some difficulty as a limited range light meter to guide the photographer when setting a manual exposure. Upon moving the aperture ring to any of the individual aperture settings the meter shuts off and the aperture needle only displays the user selected aperture. Likewise, when the camera is in its "flashmatic" mode a camera selected aperture is displayed for a given GN setting and focusing distance. In short, the light meter only works in the AE mode. In addition to the shutter and aperture controls there are two tiny levers at the bottom of the lens barrel. The first lever is for setting the appropriate Guide Number for a particular flash unit. This feature will enable the Olympus 35-RD to select the appropriate aperture automatically when the camera is set to its "flashmatic mode". The second lever, is out of sight and out of mind, but its the film speed setting. One can carelessly move this tiny lever when removing or placing the camera into a carry pouch Do check this lever before begin shooting with the RD. 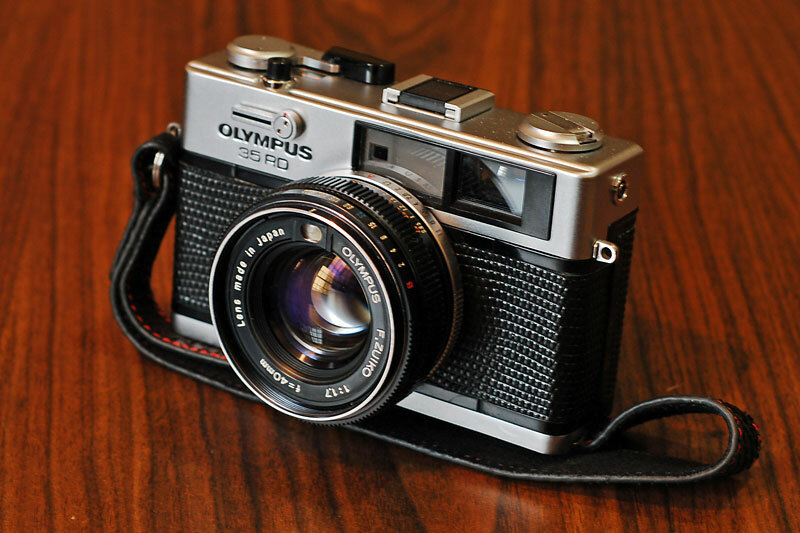 In its unmetered manual mode Olympus designed the 35 RD to be a compact 35 mm with serious capabilities. For us old folks, the 35RD uses a 100% mechanical between the lens leave shutter. As opposed to battery power, it relies on springs and gears. Therefore, even if its battery dies, the 35RD, will keep going, albeit without a meter. I have a jaundiced viewpoint with regards to the built-in light meter on the Olympus 35 RD. First, the light meter only functions when the automatic exposure mode is selected. Second, the user has to push the shutter release to the half-way position for a meter reading. Third, the meter is apt to give false readings, if one is in a hurry when pressing down on the shutter release. To operate the 35RD as a maunual camera and use the built-in light meter also requires the photographer to switch back and forth between modes. I find that switching between the auto mode and manual mode to get a light reading to be very inconvenient. Therefore, it is best to use a separate hand-held light meter or become familiar with "the Sunny 16 Rule" to use the camera in its manual mode. It adds accuracy and is much quicker when trying to capture an action shot. In its shutter-preferred auto mode things get easier, but a lot slower, in my opinion. Unless one takes precaustions, AE exposures on the Olympus 35RD are simply not as precise as manually set exposures. In theory, when shooting a scene with uniform lighting, one only needs to choose an appropriate shutter speed, focus and then slowly push the shutter button to take an exposure. Be aware that the shutter button on 35RD has a long range of travel. The halfway down position allows one to lock the exposure and reframe the image. Therefore, the most mportant thing to remember when using the Olympus 35 RD its AE mode is to push the shutter button very slowly, (This is to assure an accurate exposure). Slow means slow, and in this case the reason is to enable the mechanical trap-needle mechanism, located at the bottom of the camera, to choose the right exposure. Pushing the shutter release too quickly will result in the wide variety of apertures being selected for the exact same scene. The CdS metering cell, which is a photo resistor, is mounted at the very top of the lens barrel. Consequently, it is susceptible to stray light light sources, such as the halogen spot lights in my auditorium. The second best piece of advice I can give you is to use a lens hood both indoors and out. Also, the old CdS cell needs a second or two to take an accurate light measurement, so allow two or three second before slowly releasing the shutter, which is especially true if you have just removed the lens cap. Metering Tips: For casual users: I find that the meter readings that a casual photographer will achieve when using the 35 RD in its AE mode are not very precise. So, here is another metering tip for anyone who will be dependent on the AE mode. In addtion to pressing down on the shutter release very slowly and using a lens hood, one can improve metering consistency by metering only the subject or a nearby object that reflects light just like your subject. Try metering by walking close up to where the subject is, so that it completely fills the viewfinder frame or simply point the camera to the back of your hand, so it fills the viewfinder. If you do the back of your hand method, hold it between the subject and the camera in such a way that it is at the same angle as your subject. In other words, the light reflecting off your hand should be at approximately the same angle to the ambient light with respect to the camera as the scene being photographed. If the ambient light is coming from behind your subject, then hold the back of your hand out in such a way as to meter its shadow. One last thing - Don't forget at this point to hold the shutter release button in its half-way position, while you compose the photo and shoot. 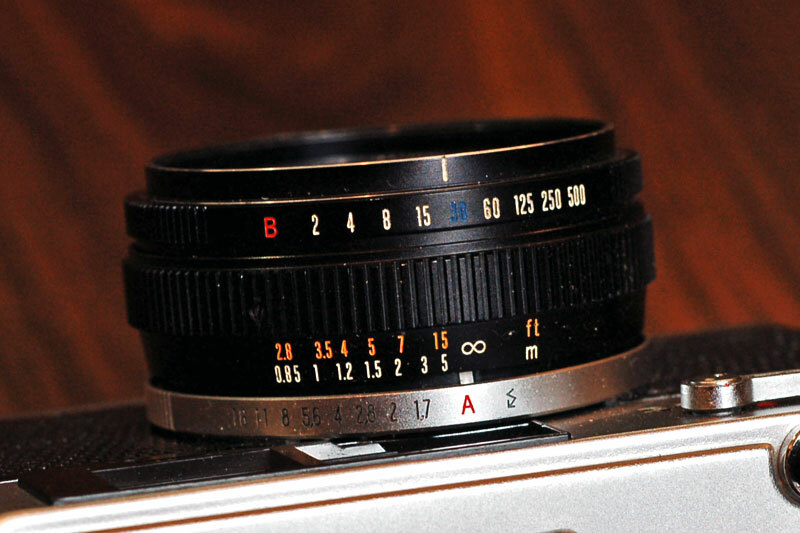 The the 35 RD uses the F. Zuiko, six element lens, which was first used on the Olympus 35DC. It's a good lens, but not as well executed as the seven element, G. Zuiko lens which was fitted to the Olympus 35SP. 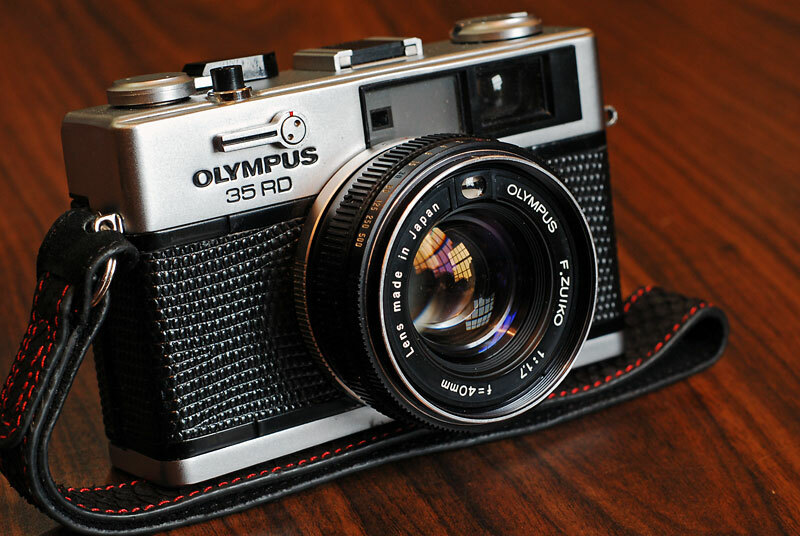 Consequently, the Olympus 35-DC at first glance looks exactly like the 35 RD. The 35-DC was a full automatic program mode 35mm rangefinder, with no manually selectable shutter or aperture settings. There is a back-light compensation button on the 35DC. Getting back to the F.Zuiko lens, it is by far a better lens than what is found on all but a couple modern point and shoot cameras, but it does have some limitations. First, like any fast lens, its optimum resolution is still between f/4 and f/11. At f/2.8 and below, accurate close-up focusing is critical, especially when shooting close ups. A compact 49mm metal lens hood is a good addition to the RD, as its lens is prone to flare from bright light sources in front or above the camera. I mention the metal lens hood, because if you purchase a generic funnel-shaped rubber hood, it will block some of the viewfinder and may dim the rangefinder patch. The Olympus 35RD is pretty versatile camera even in low light. If possible try to get by with the ambient light of the room lights. The downside of using only the ambient indoor lighting with daylight film is that exposures taken in a room lit up with tungsten light bulbs will probably have a yellowish hue in the the final print unless one uses a special lens filter or a flash unit. Choosing a flash unit: On the 35RD you get to choose your brand and style of flash. If using an autoflash unit, my preference is to use on with both manual and automatic modes of operation. The ideal flash for indoor work is one with a guide number of 45ft / 14 meter. A flash with a GN of 45 allows the use of all three GN settings on the camera and insure that the camera will then match the flash output to the automatic aperture settings of the 35RD's "flashmatic" system for either ISO 100, 200 or 400 films. To be brief, the "flashmatic" feature that makes using a indoor flash easy. There are four basic steps. Set shutter speed to 1/30th of second. Set the guide number lever to match the ISO number/film speed being used. Flash Theory: When using a manual flash or an automatic flash set to its manual setting, the aperture must be properly adjusted to match the amount of light reaching the subject. The amount of light reaching the decreases as the distance of the subject from the camera increases. Therefore, if the subject is moved farther from the camera, then the apeture needs to be opened wider. The good news is that the "flashmatic" feature on the 35-RD is coupled to the lens focusing mechanism and therefore is able to set the aperture automatically as one focuses on the subject. Just select the guide number and focus the camera. It's that easy. The GN settings on the Olympus 35-RD are referenced for ASA 100 film. If you don't know the guide number of the flash unit, then look on the back of the flash unit for an info table. On the info table look for the various aperture settings to be used for ASA 100 film. Pick a distance on the chart, usually10 feet is the easiest work with and multiply the distance times the recommend aperture setting. (no. of feet) x (aperture) = Guide Number, (GN). Now select the GN setting on the RD which is closest to the 44ft, which in this case is GN45. There are only three available guide number settings on the 35-RD. The flashmatic system is basically set up for the world of 100 ASA film and at this film speed will accept a flash with a guide number up to 90ft at this film speed. Again, try to find a flash with a GN of 45ft . It will make life 100 times easier when making the shift to ISO 200 or 400 film. The use of ISO 200 or 400 films require the use of a higher GN setting for a particular flash. Simply put, the guide number setting that works for a given flash unit with ASA 100 film will not work for ASA 200 or 400 film. So at ASA 200, the GN setting on the camera for a flash unit which was GN45 for ASA 100 film needs to be increased by a factor of 1.4 for the "flashmatic" system to work accurately. If ASA 400 film is used then whatever GN setting was used for ASA 100 film needs to be doubled. Why not use an automatic flash unit? You can, but they are certainly less accurate. With an automatic flash, simply adjust the aperture to the recommended setting for your film speed and hope that the flash isn't fooled by either a very dark subject or a very bright, highly reflective, subject. Again set the shutter speed to either 1/30th or 1/60th of a second. Before cameras with built in light meters and automatic exposure modes were common, photographers were able to set the shutter speeds and apetures using a light meter that gave readings that were recorded as EV numbers. Each EV number has a variety shutter/aperture combinations to produce an equivalent exposure for a specific light value. Exposure values aren't used much today, but they make you aware of the available light in a scene. More often than one would like, the photographer is presented with complex light situations that will not be easily recorded on film. If you master the concept of how much light is reaching your subject relative its surroundings, will overcome one the greatest hurdles towards becoming a better photographer. Below are the exposure values along with all the possible shutter speed and aperture combinations available on an Olympus 35RD. Effective shutter speeds for hand-held photography are usually 1/60th of a second and faster. That said, by carefully bracing your body and arms against an immoveable object, hand-held exposures down to a 1/15th of second are possible. At EV 15, which is a bright sunny day with no clouds in the sky, this shouldn't be a problem. However, on a rainy day, EV 9 or 10, objects in full shade under a porch, may only have a light value of EV 7 at which point the ability to hold the camera as still as possible becomes a paramount issue. A comparison of the two EV tables shows that you gain some exposure options in low light, while losing a couple of options at the brighter end of the EV scale when switching to ASA 400 film. Although, ASA 400 film doesn't produce as fine a grain negative as ASA 100, it will do for common 4 x 6 inch prints. Referenced for ASA 100 film using a shutter speed of 1/125th of second. By looking at the above chart, one should get a clear idea for the basic settings in daylight photography for ASA 100 film. The chart shows the range of light values that can occur in a daylight setting. In this case the range is four stops. 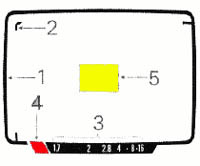 By use of the old timer's "Sunny 16 Rule," anyone can transfer the above chart, making it useful with other speed films. In short, the "Sunny 16 Rule," states that the correct exposure for a scene on a bright, sunny, cloudless day can be executed at an aperture of f/16 using a shutter speed that is closest to the reciprocal of the film speed. To use the rule, the three most common shutter speeds are 1/125th for ASA 100, 1/250th for ASA 200 and 1/500th for ASA 400. You can further derive other shutter and aperture settings from the rule. Inconsistent light meter: as mentioned earlier, the light meter on the 35-RD is an imprecise instrument. It will is easily fooled by complex light situations. So, using the light meter on blind faith alone, usually results in exposures that are off by an EV stop or more. The light meter takes in light from all sources within the frame. With knowledge of the "Sunny 16 Rule", it's easy to see whether the light meter is reading your subject accurately. By using the above gray chart, one can see how it is possible for the light in a typical afternoon scene to vary by a multiple of exposure stops. Color film can only record an exposure that falls within a limited range of exposure values. The automated printing machines found at most 1-hour photo processors usually will churn out a decent print, if the exposure contains elements that range between three or four light values. The final pirnt will allow for an exposure latitude, which may allow for an under-exposer of one EV stop, and maybe allow for an over-exposure of a stop or two. So, to outsmart the automated color "print" processor, it is necessary to insure that your exposure contains subjects that are within three or four light values of each other. No single strategy will allow you to overcome every difficult light situation where the light values vary widely between the foreground and background. One solution, which is not always practical, is to simply walk up to your actual subject, so that it totally fills the frame. Press the shutter release down slowly and hold it halfway, then memorize the selected aperture. This is a primitive form of spot metering. You can either take the photo from this perspective or back up, recompose and adjust the film speed lever to get the same aperture, as the close up. If the aperture needs to be one stop faster, one needs move the film speed lever to 1/2 of the actual film speed. To gain two stops of extra exposure, one needs to select a film speed that is one quarter of the normal film speed. Fire off your shots then return the ASA lever to the original setting. When the subjects are in the shade, I'll set the exposure for the shaded parts of the frame and let the bright highlights fend for themselves. In the provided example, the first photo was taken by pointing the camera at the subject then allowing the meter on camera select an exposure automatically. The result shows what can happen when relying on the meter without human intervention. The meter simply takes an average of the two contrasting light values, giving weight to the dominant brightness and neither is properly exposed. On the second photo, still in the AE mode, the light reading was taken off a shady patch of grass and then the exposure setting was locked by holding the shutter release half way down. Here at least the dragon is properly exposed. Notice that in both photos neither has a properly exposed background. Real trouble starts when a scene has important elements have light values that are four or more stops a part. At this point, no amount of fudging will work, because the scene simply exceeds the film's exposure latitude or more accurately the exposure latitude for a color print on an automated print processor. In this case, it's time to give it up or get out the flash unit , even though you may get a strange look or two on a sunny day. There is a better way to enhance shadow detail when the light is working against you. It's called the fill-flash technique. In short, a flash unit is used to brighten shadow detail so it can be recorded on film with a light value that is closer to the ambient light of the sunny background. The shadow detail is still a bit under exposed, but only by an f stop or two. This method is used by professional and serious amateurs alike to record subjects that would otherwise become dark silohettes against a bright background. Typically, a fill-in flash is used to brighten shadows so their luminence is with an f-stop or two of a bright background or side lighting. For the photographer, the use of the fill-in flash technique is going to be a bit more tedious than shooting with a normal indoor flash using the camera's automatic setting . If the flash is going to compete against the sun, it will be necessary to have a flash that has a guide number of 60 ft or more. Unfortunately, the upper flash limit for using the "flashmatic system" on the Olympus 35 RD is GN of 90, which means your subject will need to stand close to the camera. 6 to 12 feet from the camera is going to be the working range of a GN 60 flash unit in full sun for this purpose. Below is a not-too-brief description for using the fill-in flash technique with an Olympus 35RD. The first part of the procedure involves determining the proper aperture that will be needed to for a normal flash exposure. For this photographer starts by utililizing the flashmatic system to do some of the work to determine which aperture to use to take the actual exposure. As mentioned earlier, the goal is to select an apeture on the camera that is approximately 2 stops greater than one would use for a flash only exposure. In this way the illumination from the flash will be softer by a stop or two than the ambient light. In the second part of the procedure, we'll add one to two more f/stops to this, then set the exposure. A special note: more often than not at this point, the aperture setting will fall between two aperture numbers, such as f/4 and f/5.6. Round up to f/5.6 if the needle in the viewfinder looks like it is half-way or more between f/4 and f/5.6. Now, using f/5.6 as a reference, select the next higher aperture setting for your exposure. The recommended aperture at this distance was almost f/5.6, so we are going to use f/8. If the flashmatic had selected f/5.6 or a little above, then f/11 would be used to set the exposure. The goal in the next set of procedures is to find the correct shutter speed to use with f/8 for a sunny background. In short, set the exposure for the sunny background at f/8. Now select different shutter speeds, starting with 1/500th until the AE needle points to f/8. Surprise: 1/500th of sec and f/8 are perfect for a sunny day exposure that equals EV 15 @ ISO 100. The above procedure should result in a fill-in flash which will brighten the subject just enough, so that the amount of light that reaches the shadows on the subject is almost, but not quite, equal to the background light. In short, rather than eliminate all shadows, all that is necessary is to brighten the subject's shadows enough so that the details within them can be recorded on film in such a way that they are easily resolved in the final print. Keep in mind that the final exposure on the camera is set for the background, not the flash falling on the subject. To keep the sun lit background one stop brighter than the foreground shadow in the above example, we selected f/8 for the exposure rather than f/5.6 for a flash-only exposure, which is a one stop difference. For a less noticeable fill-flash, select an aperuture that results a two stop difference. It will appear more natural and will still brighten some of the shadow details. When successful, you will have a negative that will be easily printed by your local one hour minilab. I've written this page as a supplement to the information which can be found in the owner's manual for the 35RD. With regards to other topics such as the "Sunny 16 Rule," the use of filters or compostion, there are other web sites that do a far better job in covering this material than I could do in a couple of paragraphs. I hope the information on this page has been of use and thanks for visiting. Enjoy your Olympus 35RD. A note on copyright infringement: Please do not cut and paste any of the above work for publication either on the internet or for anywhere else without first getting my specific permission. This is a noncommercial web page written for educational purposes and it is intended to be of assistance to anyone interested in amateur photography. No I didn't invent the wheel, but the above web page is my interpretation of the wheel and I've tried my best to be original, (even to use my own photographes when there are much better ones on other web pages). Fair use in my book allows for appropriate content from this page to be used for description purposes by search engines, reprinting for personal, (not commercial), use. On personal web pages please provide a link on your web page that states, "See Andrew Yue's web page for more information." The views expressed on this page are my own and do not reflect an endorsement of any kind by the University of Texas at Austin.